The first time it was in Gualcamayo and now over Route 150. There is commotion in Jáchal because there have been two cases in less than a month involving people who made public their photos of UFOs crossing the northern skies. 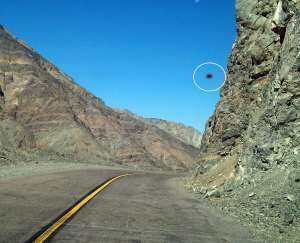 On this occasion, a native of Jáchal living in Buenos Aires states that he photographed one while he and his familly drove between the mountains on Route 150. The photos were taken by Héctor Daniel Godoy, a "jachalero" residing in Quilmes who had gone back to visit his home town. Several days ago, Héctor, his wife and a cousin decided to tour the upland valleys of Iglesias. On the way back, the party took several photos of Route 150 without noticing anything strange in the sky during the drive. The surprise came that evening, when they downloaded the photos to their computer and discovered that a brown, oval shape -- suspended in mid-air -- appeared on two separate photos. On one photo, the object is visible between the mountains and behind a blind curve on the road; in the other, the shape contrasts clearly against the sky. "We realized something strange was going on when we downloaded the photo. Upon magnifying it, we couldn't believe it. It surprised us and startled us," explained Godoy. Thus, the subject of the alleged sightings became the talk of the town in stores and confectionery shops, as well as in the local media. "People have been phoning the radio shows and commenting a lot. They're wondering what's going on in Jáchal, why so many cases are ocurring one after the other, and others revisit the fact that the area has a tradition of seeing strange things in the sky. There is true commotion," stated journalist Hugo Herrera from Radio Nacional. The previous case involving an alleged UFO photo became known on November 15 of this year, when a miner went public about a strange object photographed with his camera as he drove over a track in Gualcamayo. Curiously enough, the oval shape was exactly like the one recorded three years earlier by some 20 operators from the Gualcamayo mine. During this sighting, all of the machines on site ceased to operate, according to the stories told. Argentina: Another UFO in Gualcamayo? Spain: A UFO Crash in 1899?